Honda and GM are building a new facility to allow them to create hydrogen fuel cells for a new era of cars. But is it already too late when electric cars are so dominant? So we’re all going electric right? That’s what the experts say. Lithium ion batteries are supposedly getting better and that renegade Elon Musk and his Tesla cars they’re the wave of the future. Except, they might not be. There are still significant gaps in the technology and while many major manufacturers have embraced the idea of a hybrid car and some have gone so far as to promise full electric cars Honda and GM have gone in a different direction. 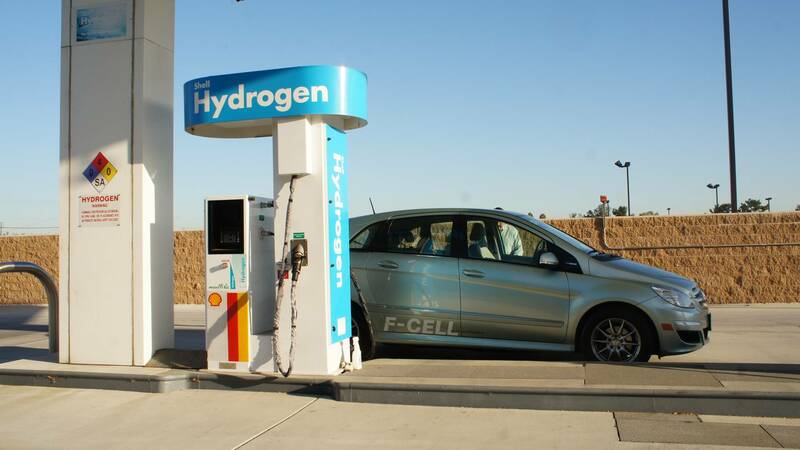 On Monday the two automakers announced that they would invest $85 million into mass production of hydrogen-powered cars by the year 2020. The two companies are developing a facility in Brownstone, Michigan to produce hydrogen fuel cells. The purpose of this is to reduce overall costs while sharing intellectual property to improve results. Some of you may question this decision with the mental image of the Hindenburg disaster flashing in your minds. For that, we will point out that the Hindenburg was a 7,062,000 cubic foot balloon filled with hydrogen covered in a flammable substance that was never designed to use hydrogen in the first place and was retrofitted to do so in 1937 during a helium export ban. By Nazi. Hydrogen as a fuel source doesn’t work in cars in the same fashion as gasoline, wherein the gas is injected into an engine cylinder before the piston fires against the spark plug and propels the piston down creating motion. A hydrogen fuel cell has hydrogen passing through a proton exchange membrane as its electrons form a current which then charges the batteries for the electric motor. Then the hydrogen protons and electrons reform and combine with oxygen to make water. We’re serious, that’s it. That’s how it works. This is what your high school chemistry teacher was ranting about in class. We’ve known about this for a long time. As such the technology behind it is relatively safe. The only way it would become dangerous is if you shoved a flaming drill into your car’s hydrogen tank, which would be dangerous in a conventional gasoline car so just stay away from that business. The biggest and most immediate benefit to the use of hydrogen cars is that it is a zero-emission car that also beats an electric car in total range. The average electric car can manage around 100 miles to the full battery with the Tesla Model S edging it out at over 200. For a reference, a conventional 4-liter gas car would manage about 400 miles to the full tank. The Honda Clarity comparatively has a 366-mile range and fuels its tank within five minutes. Again, this is compared to the half hour minimum for the fast charge on the Tesla. The problem is, from a business standpoint, this is a product that is competing with electric cars and hybrids who already have a strong foothold in the market. For comparison, there are over 15 thousand charging stations in the US versus 33 hydrogen stations, most of which are in California. The reason for this is in part because the cost of setting up a hydrogen refueling station is between $1-2 million as opposed to the $300,000 for an electric vehicle charging station, never mind the fact that homeowners can have one installed in their homes. As it stands, Honda started leasing its first hydrogen-fuelled car last year in California while Toyota has had the Mirai since August 2015. Meanwhile, General Motors, Lexus, Audi, BMW, Ford, and Mercedes-Benz all have unveiled models in development. Despite these businesses developing all of these hydrogen-fueled cars they still suffer the fact that they’re coming in behind electric vehicles who’ve already made a positive impact. By the time 2020 does roll in whatever flaws in range and charge time electric cars have may already be gone. Very good comparison to the electric car and the charging stations. I think the space and overall cost are enough to keep the hydrogen stations away. I have always liked the concept and looked up to companies that can take things to the next level, but why hasn’t the car really taken off yet? The price cannot be an issue when you have GM and Ford trucks costing $60,000.